With its Mediterranean feel and picture-postcard scenery, this beautiful seaside town has been attracting visitors for more than a century. Set between the waters of Loutit Bay and the cool Otway forests, Lorne has a charm that's hard to surpass. 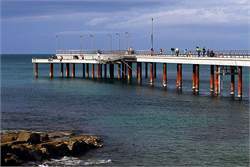 Add mild weather, café culture, shops, boutiques and galleries and you have one of the Great Ocean Road's most popular stopovers. Visitors come to enjoy the natural surrounds. The sheltered 2-kilometre beach is safe and is bordered by lawn, gum trees and picnic and barbecue areas. Discover the Erskine Falls cascading into a beautiful fern gully in the Great Otway National Park. Relax with a latte at a sidewalk café, picnic under the trees on the foreshore or dine on freshly caught seafood at a local restaurant. 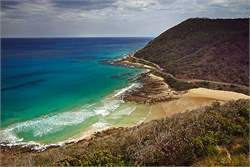 ~ Drive the famous Great Ocean Road and experience one of the world's most breathtaking coastal drives. 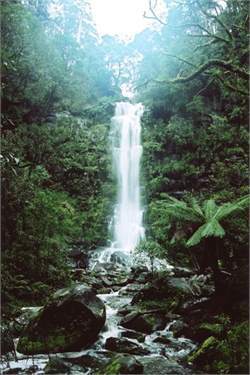 ~ Explore cool fern gullies and cascading waterfalls in the Great Otway National Park. ~ Swim in the clear waters of Loutit bay, surf the waves, or cast a fishing line into the river or surf. Travel by car via the Great Ocean Road. Daily coach services are available from Melbourne or rail/coach services via Geelong.